We’re nearing the end of our home haunt journey (but we still have a few more pro haunts to return to as well), and today, we’re sticking around in Orange County for a neat and unique haunted attraction that I first learned about several years ago but never had a chance to visit: Haunted Mansion Haunt. Tucked away in the South [Orange] County foothill community of Trabuco Canyon, just northeast of Lake Forest, Haunted Mansion Haunt loving tribute to one of the most popular attractions in Disney park history. 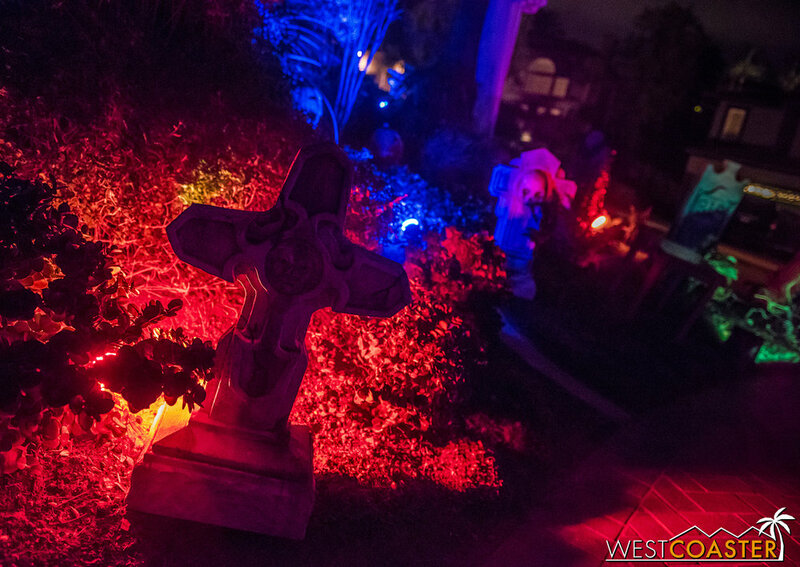 It’s a part haunt, part yard display that first came to life over a decade ago, slowly building up to a dazzling and impressive homage and even earning a visit and glowing reviews from Theme Park Adventure six years ago. But then, like a ghost, it vanished, going dark. And it wasn’t until this year, almost without warning or expectation, that this charming and elegant home haunt sprung back to life. Ghostly figures stand outside the Haunted Mansion Haunt. Unlike its previous iteration, this year’s Haunted Mansion Haunt has been redesigned and scaled down to effectively run under a crew of one. Rather than sprawl completely around the side yards and back yard of the Trabuco Canyon property, the retooled walk-through occupies the front yard, garage, and part of the right side yard. Despite the lesser footprint, it still provides an impressively creative experience in tribute to the classic Disneyland dark ride. As with all re-imagingings across a different medium (take a movie adaptation of a book, for example), translating a moving, vehicle-based theme park attraction into a walking haunted house requires some revisions and condensing of scenes. Nevertheless, Haunted Mansion Haunt hits all the beats of the ride with its innovative sequence of scenes. 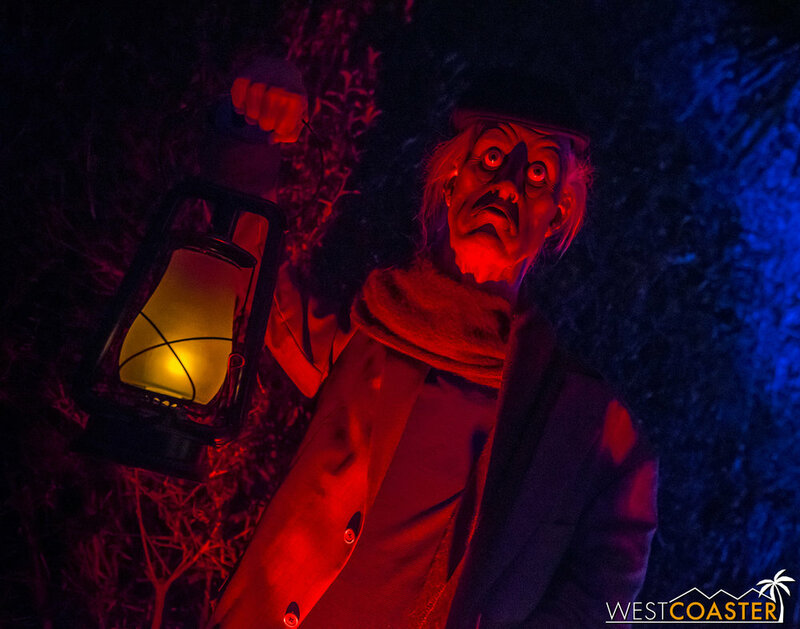 The last time Haunted Mansion Haunt was open, the Hatbox Ghost was still a legend of the past. It has since rejoined the actual Disney attraction, but this home haunt version is pretty cool too. 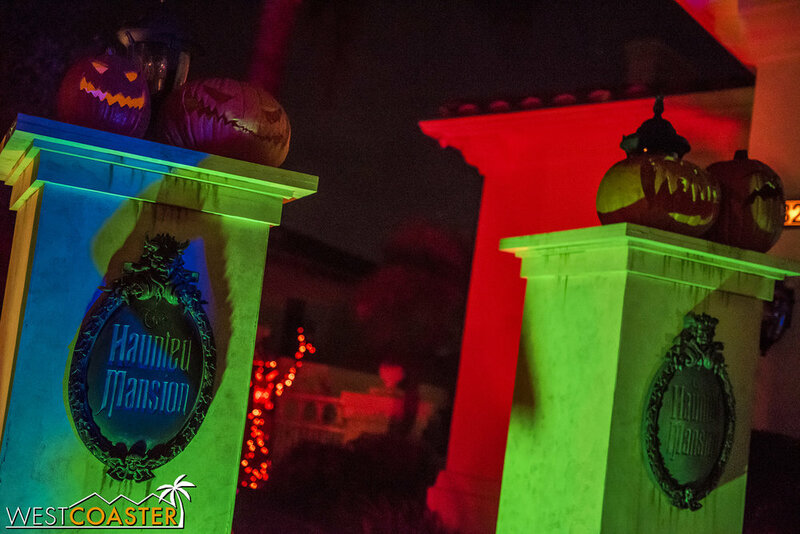 It all starts with the arrival, where an adaptation of the Mansion’s graveyard manifests in the front yard. 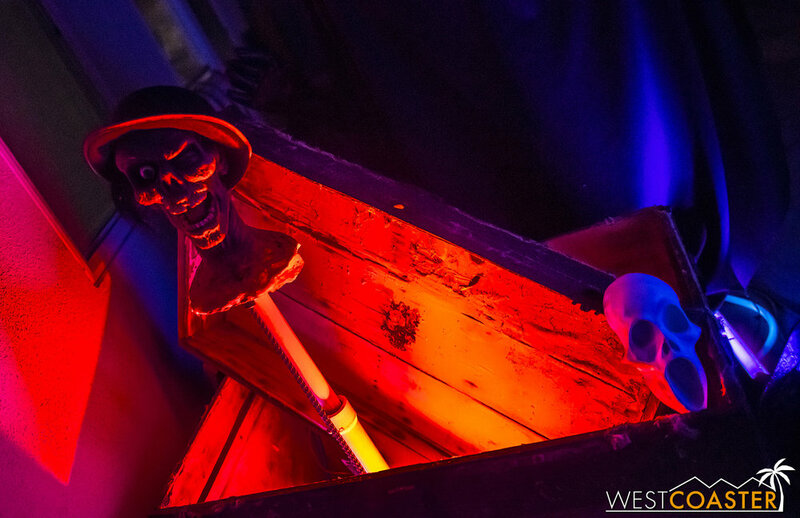 Ghostly figures and colorfully lit tombstones abound—all hand-crafted and literally one-of-a-kind. They’re joined by the familiar soundtrack of the Haunted Mansion, gleefully showcasing the energy of the happy haunts and grinning ghosts. To the other side, two familiar pedestals bearing the Haunted Mansion logo guard a bit of a pet cemetery, but the entrance to the attraction itself is actually through the garage! No, the stretching room doesn’t stretch the portraits, but this works to convey the idea. The tour through Haunted Mansion Haunt begins—expectedly enough—in a gallery, with paintings showing paintings of some of its guests as they appeared in their corruptible, mortal state. Yes, there’s an adaptation of the famous stretching room and a delightful preshow sequence that mimicks the opening scene. Believe it or not, the room—in its own creaky way—actually stretches! And the scene culminates with a startling surprise revealed by strobes and scrim. Then, it’s onto the rest of the mansion. Compressing the experience means hitting the beats of ride rather than elaborately recreating every detail of every scene. 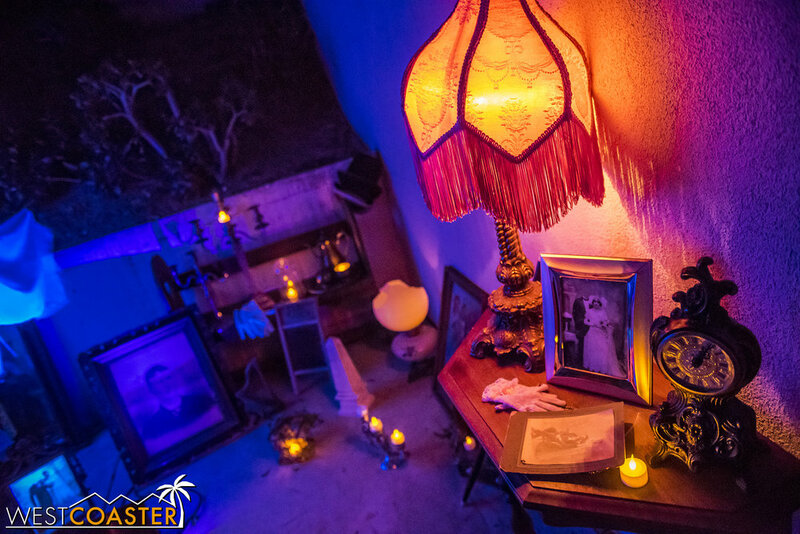 Guests wander through a hallway with changing portraits, see a bust that seems to most unnervingly track their movements, stop by a seance with Madame Leota, and emerge out the attic into the graveyard, where famous figures like the Hatbox Ghost can be encountered. They come back out on the right side yard, passing the cemetery caretaker and even the singing busts. With a few surprise startles scattered about, it all adds up to a charmingly spooky experience, probably a little scarier than the real Disney attraction, but not too intense to discourage families and children to go through. Recognizable faces (and bodies) have been impressively home-made. What’s really impressive about the Haunted Mansion Haunt is all the programming, sound mixing, lighting programming, and synchronized effects. 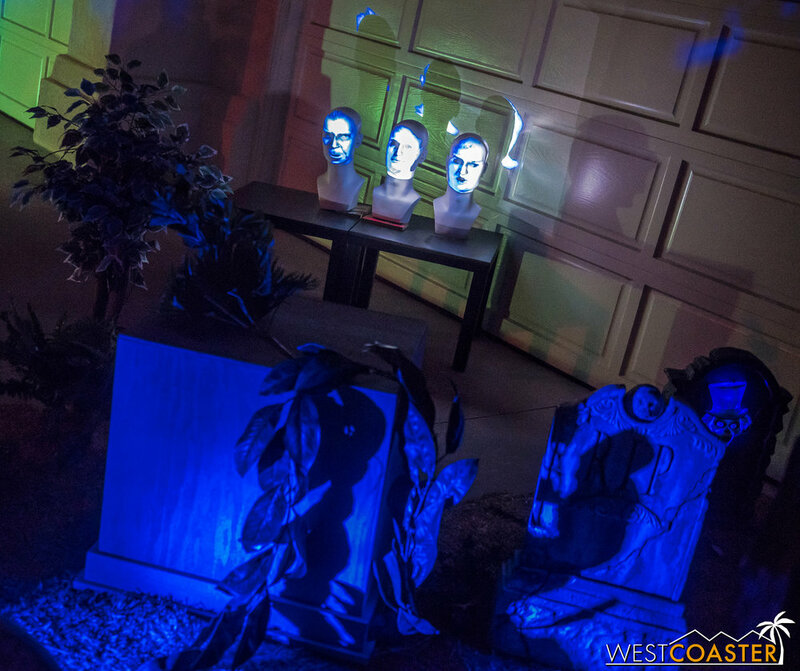 There have been a lot of behind-the-scenes upgrades applied to his haunt since its last appearance four years ago, and the seamless operation of the haunt itself is a testament to the detail and attention and technological savvy that has been applied to the redesign. The outdoor props are also all portable—designed to be removed and stored if inclement weather occurs. This proved handy the night before Halloween, when harsh Santa Ana winds required the attraction to go dark for the evening, lest the figures be blown over and permanently damaged. It’s unsure if this year’s apparition was a one-year comeback or the start of another run, but I certainly hope it’s the latter. 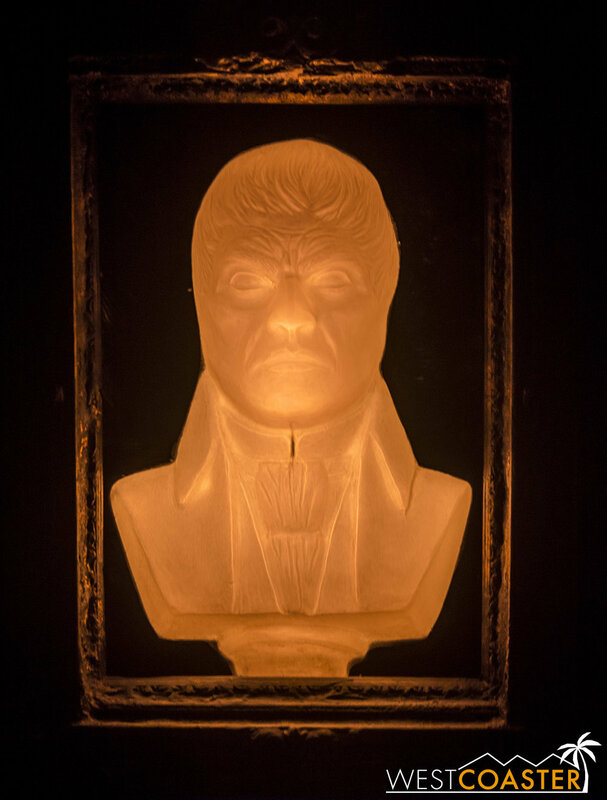 Haunted Mansion Haunt, despite its curtail, remains an awe-inspiring home haunt that reminds people of the joy of Halloween and spooky Disney and truly showcases the shining aspirations of fandom. 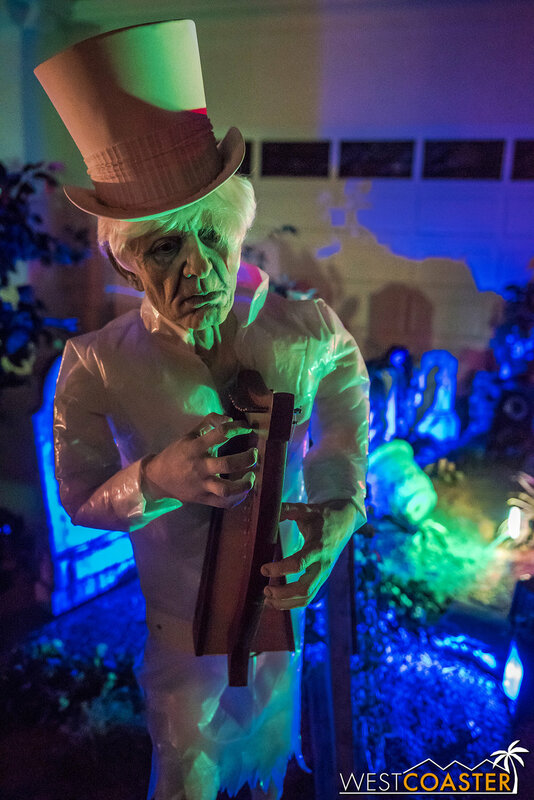 Its run this past season was only for a few days, but anyone who stopped by to visit definitely received a ghoulish delight and a laudable treat! Perhaps Madame Leota can shine a light on the situation. 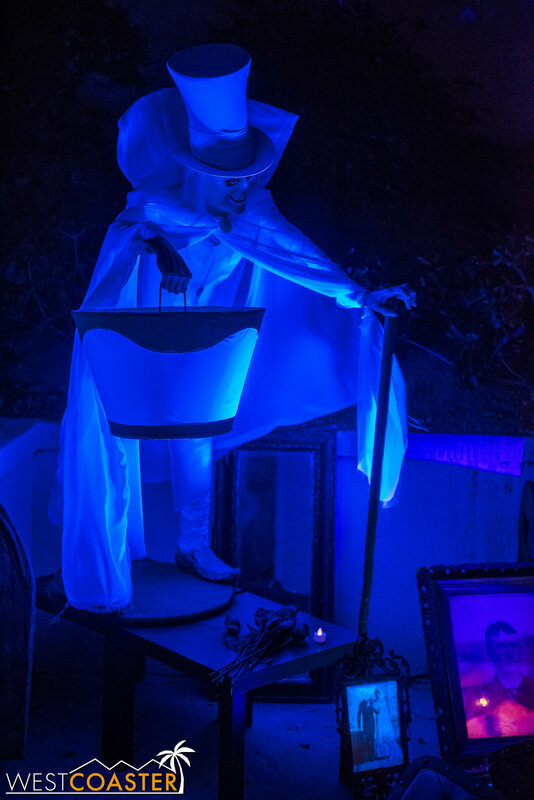 Haunted Mansion Haunt is located 28322 Millwood Rd, Trabuco Canyon, CA 92679, just north of the city of Lake Forest. This past season, it was open the last Friday through Sunday of October, plus Halloween. But due to popular demand, the two nights bookending Halloween were also added (October 30th ended up being cancelled due to potentially harmful Santa Ana winds, though).